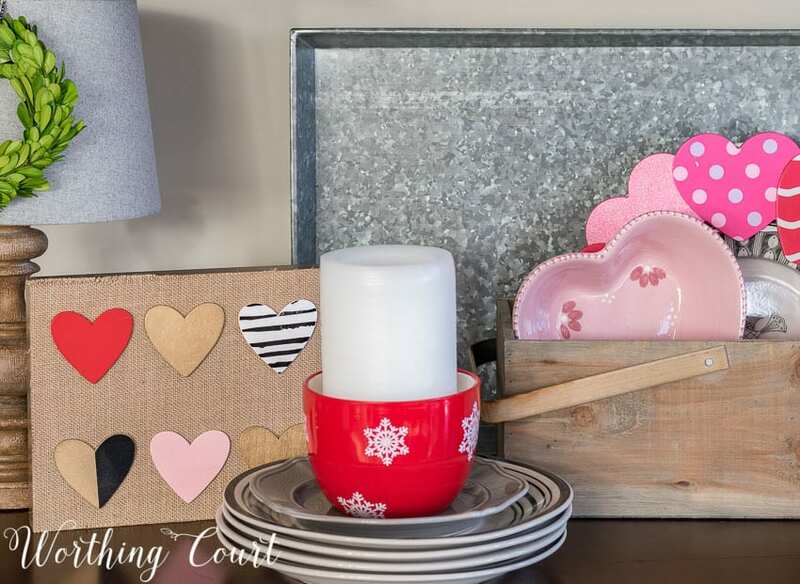 Use this great idea to make your decorating for Valentine’s Day, or any other time of year, fast and easy! Do you have a spot in your home is that is your favorite place to decorate for the different seasons and holidays throughout the year? My favorite space is the open shelves in my breakfast area! Why? Well, it’s because they are one of the most visible spots in my home. Located through the wide opening from the family room into the kitchen/breakfast area, these shelves are impossible to miss whenever we’re moving about in our house. If you caught this previous post, “How To Quickly And Easily Keep Shelves Decorated As The Seasons Change”, then you already know that my mission today is to show you how you can very quickly and easily add seasonal or holiday decorations to any spot in your home. The secret is to start with a base of basic, mostly neutral items that will allow you to get a whole new look and celebrate any holiday or season with just a few easy changes. Take a look at this side-by-side comparison – a basic winter look is on the left. You can see that by using a mostly neutral background, how easily I was able to only switch out a few things to go from Winter to Valentine’s Day. I don’t do a ton of decorating for Valentine’s and I don’t have very many Valentine’s Day specific decorations, so I keep them all in a small tub in the place where I store the rest of my decor. All I had to do was to bring that small tub downstairs and pull out what I wanted to use on my shelves this year. Let me explain just how quick and easy it was! Take a closer look at the right side of the shelves. The white casserole dish on the top shelf was replaced with an adorable sitting pillow, I added a cute Valentine’s heart plaque to the second shelf and a wonderful scented Valentine’s candle to the bread board on the bottom. Get the directions for how I made that cute wreath for under $10 by clicking HERE. On the left side, I tucked in a larger Valentine’s heart block to the decorations on the top of my sideboard. 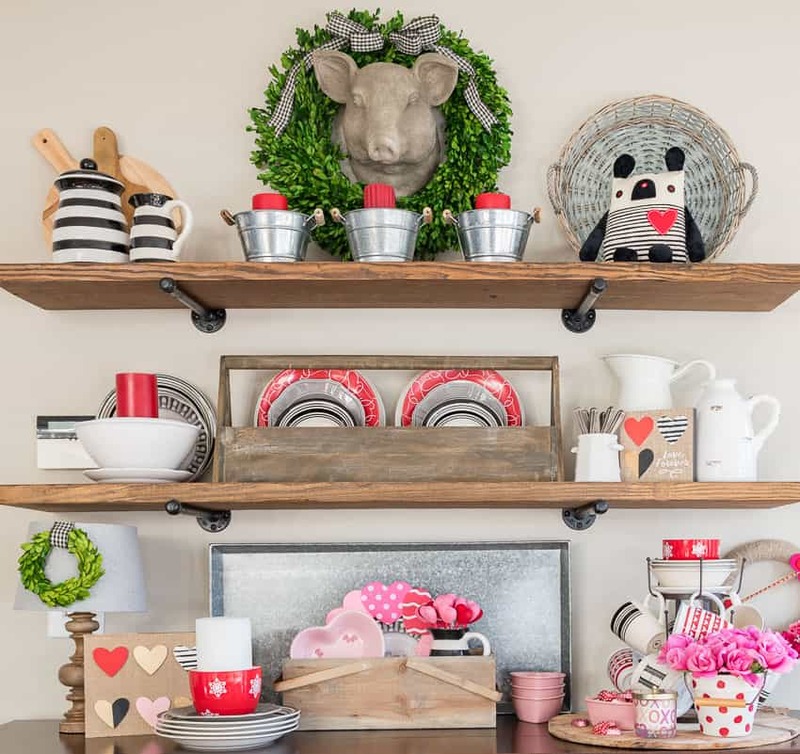 You can see that on the rest of the shelves, I simply replaced the white candles on the top shelf with red ones, added Valentine’s themed dishes to both tool boxes and then switched out some of the accessories displayed on the round bread board that the lamp is resting on. So – have I convinced you yet? I challenge you to find a spot in your home where you can put these same principles into practice! I’m heading to Hallmark , love to decorate for all the holidays and you gave me more ideas. 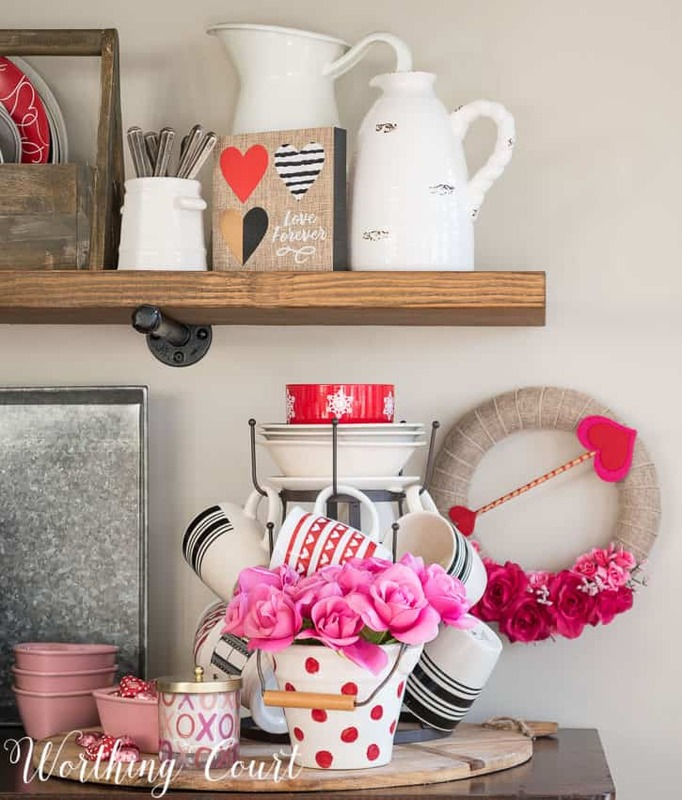 I’ve never decorated for Valentine’s Day, but this is really cute without being “sappy.” I will definitely re-think and do some decorating!! Thanks! So festive and quick to do. I love it! Love your decorating style simple but oh so cozy! 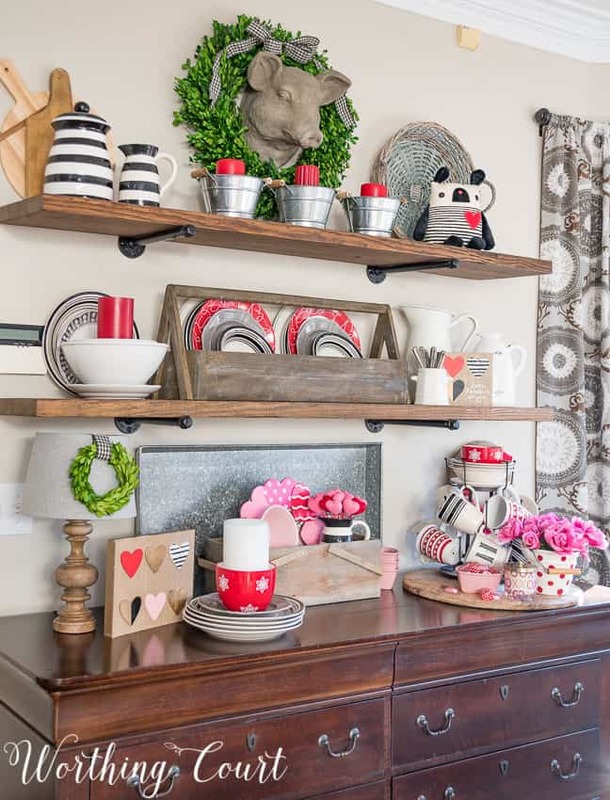 Good idea to change up your shelves and add red decor for Valentine’s Day. It looks great. I’ve got to get out my stash. I’m sure some new items are needed! My husband’s birthday is Feb 14th so I’ve always decorated for Valentine’s Day. Cute ideas!! Thanks for sharing. I like your side-by-side photos of your decorated shelves. They show what a difference just a few items and a little color can make. It looks nice and “Valentine-y”. So cute. I think a trip to my local Walgreens is in order. We purchased all the supplies to make our shelves this weekend. Can’t wait to get them up so I can have fun styling them. By the time I get 6 Christmas trees down, I’ve never even considered decorating for Valentines Day, but…. you have made it look so easy so what the heck!! Thanks for these tips. The older I get, the more I’m looking for quick and easy. I’m curious. How did you attached that little wreath to the lampshade? Hi Nancy. I wrapped the ribbon that you see around the wreath and added a small spot of hot glue to back of the lamp shade, right up under the rim. Hope this makes sense! I love wreaths and enjoy seeing how you incorporate them in your displays. Love the versatility of that area. I have never been a Valentine’s Day decorator….is a matter of fact, I might not own anything red/pink. Eeek. Maybe I will have to change that. I really like what you have done. Thank you for sharing. Like someone mentioned above, I too liked the side by side photos of the shelves, very nice! Lovely touches of red and pink! Everything looks wonderful!!! Nothing like red, white and pink to cheer things up! Oh my goodness! You are a shelf decorating ninja! 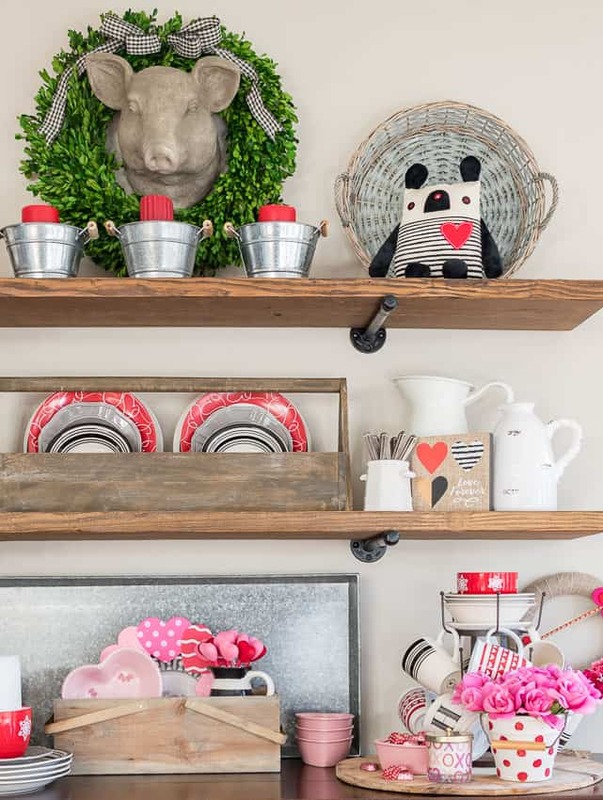 Love the way you tucked in just a few valentine items with the every day stuff. Quick question… Where did you get the metal cup and saucer holder on the lower right side? So cute!! Those shelves are really cute. I know you will be excited to see your granddaughters’ reaction to their cards and valentine necklaces. I love the way you decorated the shelves. I love your curtains, where did you get them? Hi Karen. The curtains came from Target, but I don’t they’re available online any longer. Your shelves look great! I love the Valentine touch! Who doesn’t love hugs and kisses and hearts??? I love how your change your house for different occasions. You give me great decorating inspiration! Thanks for all the wonderful ideas your house is amazing! What a nice Valentines’ Day vignette! Just enough touches of red and pink without being over the top. Super cute! I love it! Where did you get the little pink heart tins that are stacked? And also the pink heart dish that is in the wooden basket? Once again, another a great idea. You did such a cute job on everything. I love the black and red you added. It all looks so cute, especially the mug rack! And those cards are adorable! I have been hunting for some cute cards to send my nieces and nephew, thanks for sharing these! Love, love, love the cards you selected for your granddaughters. I’ll be looking for them! Love your blog. It very inspirational to me. Another great post! Your decorating style proves you don’t have to spend a fortune to make some changes that pack a wallop! It’s a transition that’s simple but effective and easy to change out again and again. Many thanks! I so enjoy reading your posts! Love the cards for your granddaughters with the sweet necklaces! Headed to Walgreen’s today – love their Hallmark section. Your shelves look awesome. Thanks for the decorating ideas. Love your style, I get lots of inspiration from your great ideas. Thank you! Oops… 2/7 and I haven’t put out the first Valentine item. Thanks for the inspiration. I love the simply – quick and easy you share to change decorations around the house, keeping with the seasons! Fun! I love how you can switch up the area based on holiday. So cool!!! I don’t typically decorate for Valentine’s Day — although I am a hopeless romantic! — because it always seems to kitschy. But you have clearly demonstrated how just a few well-placed Valentine-inspired pieces can celebrate Cupid’s Day without going overboard! LOVE it! Love cozying things up for winter…but I am thinking about spring decorating soon. My daffodils and tulips are popping up and the lack of snow here is making us all a bit antsy for spring. Love reading your blog! Cute and cheery! 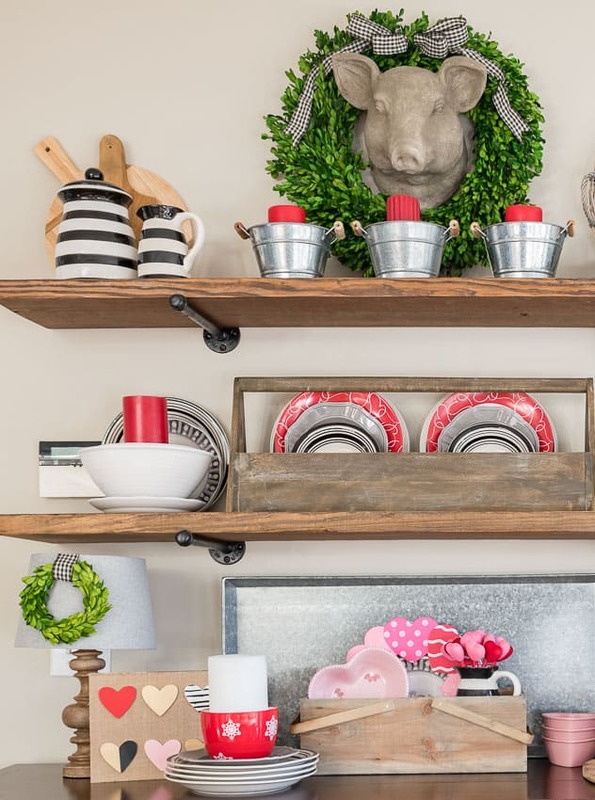 Enjoy the change-up to the shelves you do for holidays and seasonally. Thank you for sharing your fun ideas! 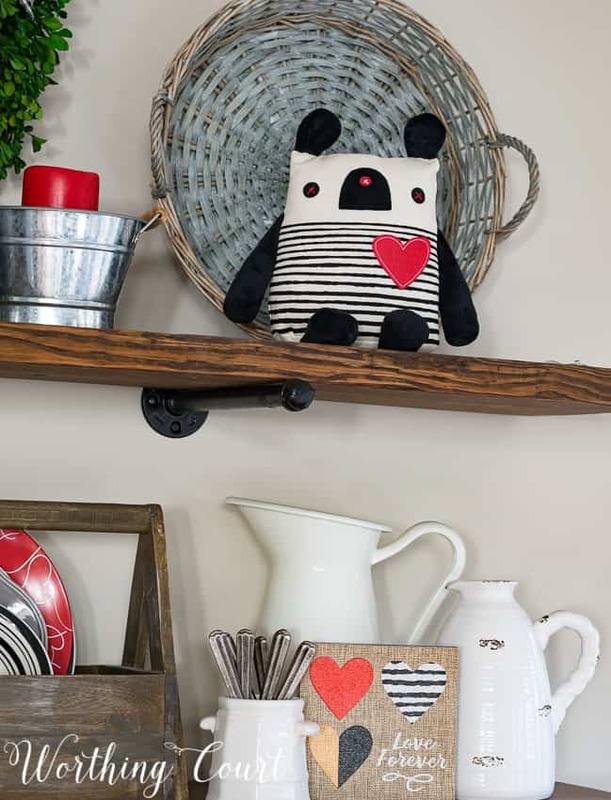 Your Valentine’s Day décor is adorable! I too frequent Hallmark and love their décor items! 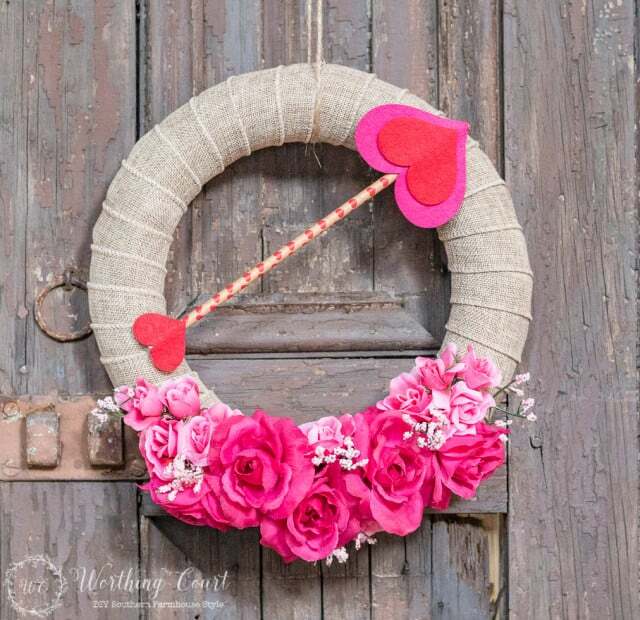 Your VAlentine’s decorations are adorable! I also loved your post this morning of your awesome coffee bar. The reason i am posting a comment to this post is because I just had my kitchen painted (Revere Pewter, woot! Woot! ), and I took down my very dark espresso stained wood shelves that were short, and want to make longer ones (about 5 feet) in a lighter color similar to yours on a wall that my old Baker’s Rack was on. Could you please share where you got your wood, and did you stain them yourself or were they pre-finished? I’m having a hard time finding real wood, and wood that is already finished. I’m trying to save my husband some work and time. Any advice you can share is much appreciated! Hi Beth. Congrats on getting your kitchen painted! Due to the length of my shelves, I wanted them to be thick (they’re 2″) so that I wouldn’t worry about them bowing from the weight of heavy things that I knew I would inevitably place on them. I wasn’t able to find wood that thick at Lowes or Home Depot, so I went to an actual building supply store in my area. They even cut them to length for me. :DI stained them myself (super easy!). I was lazy and didn’t add polyurethane to them, but I wish that I had so that they would be easier to dust.